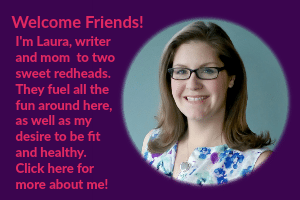 Welcome back for another month of Virtual Book Club for Kids! Today I have three super fun Pete the Cat Activities, inspired by the super fun books of Eric Litwin, and I'm joining an awesome team of bloggers so be sure to check out all the fin ideas at the bottom of the post! 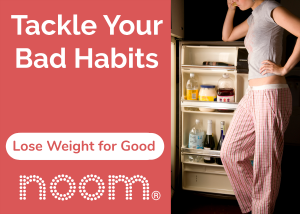 Oh- quick note- affiliate links are included for your convenience. We actually had never read the Pete the Cat books before a couple months ago and I'm SOO glad we found them. My two year old son and my four year old daughter literally come RUNNING to the couch when I tell them I've got a Pete the Cat book to read! Right now we have Pete the Cat and his Four Groovy Buttons as well as Pete the Cat I Love My White Shoes. I cannot wait to check out his new book called The Nuts: Bedtime at the Nut House because seriously I just watched the music video at that link and I can tell you right now there are two little NUTS at our house who act just like Eric Litwin's Nuts EVERY night before bedtime! Holy cute book, Batman! But I digress, let's get back to THESE super fun books! These three activities go great with Pete the Cat and His Four Groovy Buttons. This seriously got the MOST giggles from both kids. It was SO funny! These are really just craft buttons (similar to these on Amazon) to which I attached black fuzzy sticks (ours were sent to us by CraftProjectIdeas.com, thanks!) or pipe cleaners. I basically just fed the end of the fuzzy sticks into the button holes and back down and wrapped it around itself to secure it. Then all you do is wrap them around your finger into a coil. The kids press them down and let them go and they POP up! It's pretty hilarious actually. You probably will have to reform the coils every so often. I had to do it more often with my toddler than my preschooler. I'm sure some pipe cleaners will be more resilient than others! This was so quick. So. easy. SO hilarious! So my 4 year old daughter has been practicing writing her name at preschool and she keeps writing a capital E even though the E is not the first letter of her name. So her teacher has had her practicing her lowercase E's a bit extra. This was the perfect timing for us to practice this actually. I noticed how the “boing” lines by Pete's buttons looked similar to a lowercase E so I thought it would be fun to do kind of a pre writing activity. 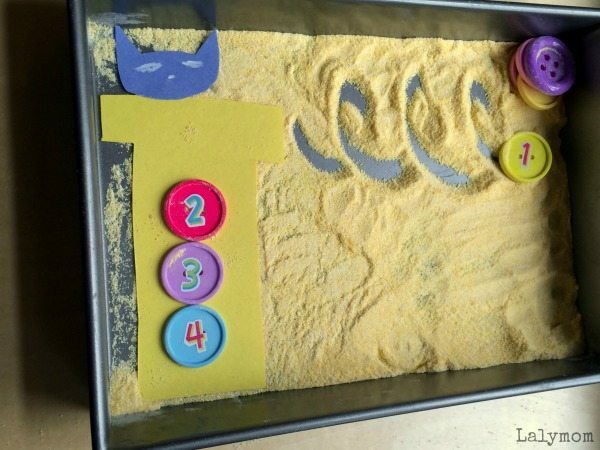 We could have done a salt tray for this activity but the kids always mention how on one page Pete's button pops off and rolls into the sand, so I just used a bit of cornmeal to look like sand. I stuck number stickers to the buttons and we sang the song (the kids LOVE watching the video by the way!) and when we came to the part when Pete's button pops off and rolls away, she would pick up the buttons and draw the swirls with the button. Oh, the yellow shirt and Pete head are just quickly freehand cut from construction paper. I drew the face with chalk. I know it's no Michelangelo but she instantly knew who it was so I was okay with that! She swirled pretty well too! Here is a pass where you can see the resemblance to the lowercase E but she had fun just swirling and swirling and eventually playing with the cornmeal with her hands too. Sensory play! Bonus! Another one that was fun, easy and good practice for my daughter's writing skills. Win-win! The last activity we did was based on the Cut-PUNCH- Paste fine motor crafts we have done in the past. Cutting practice, pressing and squeezing paper punches and using a glue stick are all super fine motor skills activities to get those little hands working! I set out a piece of yellow construction paper folded in half with a couple lines to cut, which would turn it into a shirt. Next we used our large circle paper punches to punch out buttons and then the small circle punch to punch out the button holes. 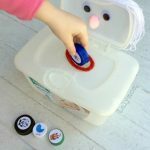 You can just make button after button and play with them, reading the book and popping them off, or you cold glue them on for a take-home craft. It's up to you! I just kind of free-hand cut out Pete's head and paws but you could make that part of your cutting practice too if you wanted! We popped on the googlie eyes for fun but white chalk works to draw on the blue paper too. 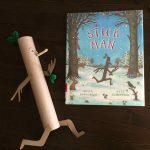 This post is part of the Virtual Book Club for Kids which means there is a host of other awesome bloggers who shared super fun ideas based on these books too! We take a break from the Virtual Book Club for Kids in December but we will be back in January with new titles and activities! 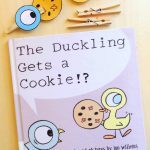 In the mean time if you are looking for more Kids Book activities and ideas, check out these posts and be sure to follow my Kids Book Activities Pinterest Board! I love the boingy buttons and how you related them to looking like a lowercase e! So smart! Love the “boing” buttons. So fun!